The Pacific Institute has released a comprehensive assessment of the costs to California of lost hydroelectricity during the four years of drought from October 2011 to the end of September 2015 (the official California “water year” runs from October 1 to September 30). Under normal conditions, electricity for the state’s millions of users is produced from a blend of many sources, with natural gas and hydropower being the top two. Since the drought has reduced the state’s river flows that power hundreds of hydropower stations, natural gas has become a more prominent player in the mix. This is an expensive change. According to the Institute’s new report, the four years of drought led to an increase in electricity costs of more than $2.0 billion. The additional combustion of fossil fuels for electric generation also led to a 10 percent increase in the release of carbon dioxide from California power plants. 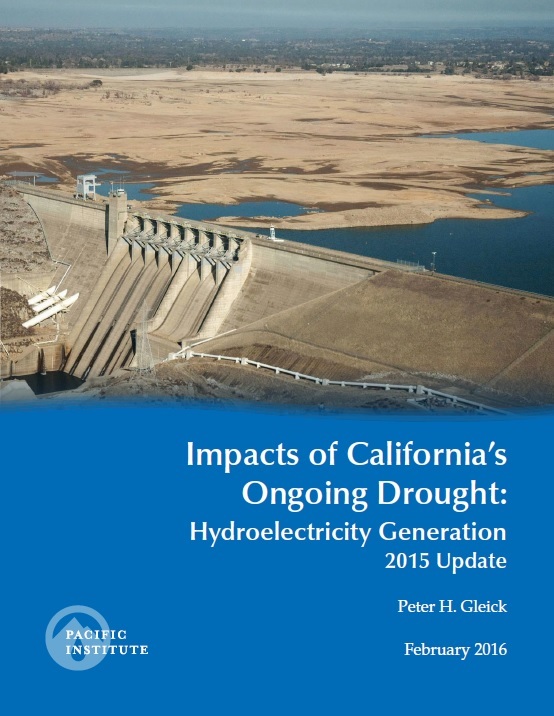 In addition, the report notes that the ability to expand California’s hydroelectric capacity is limited, as there are few undammed rivers, little unallocated water, and growing environmental, economic, and political constraints to adding new hydropower capacity. In an average year, hydropower provides 18% of the state’s electricity needs. Comparatively, during the four-year period from October 2011 through September 2015, hydropower generation was at 10.5% of total electricity generation. For the most recent water year overall, with the state’s reservoirs at record low levels, hydropower was far below normal, providing less than 7% of total electricity generated in-state. Despite the state’s winter rainstorms, the drought has not ended: reservoir levels remain abnormally low, precipitation and especially Sierra Nevada snowpack are just slightly above normal, and hydroelectricity generation is expected to continue to be below average until the reservoirs refill. Thus, we expect costs to California ratepayers and to the environment will continue to mount.